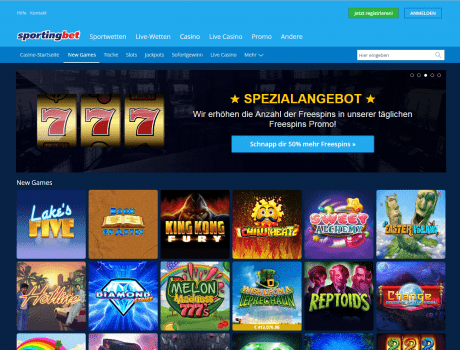 This indicator depends on the variety of ways which Sportingbet Casino offers his clients to contact customer support and the speed with which it solves a problem, as also the overall customer experience. The reputation rating of Sportingbet Casino is based on its popularity in online space - comments, user ratings on other sites, and social networking likes. Collect points for your activity in Sportingbet casino and get up to 100 Free Spins in selected game every day. The more points you collect, the more Free Spins you get. Sportingbet casino are crediting Free Spins at the end of every daily round. Each daily round starts at 00:01 CET and ends 24 hours later at 23:59 CET. All points collected within the respective time period will count towards the daily round. See the table below to see what prizes you can win. Only bets placed for real money/in-play mode will count towards this promotion. Bets placed during any Free Spins and bonus money (when fulfilling wagering requirements) doesn’t count towards this promotion – no points are awarded for these bets. Maximum number of Free Spins per customer per daily round is 100. Free Spins will be credited to customers within 6 hours after end of the respective daily round. VIP game Free Spins will be available in the game Twin Spin. Non VIP game Free Spins will be available in the “Game of the Day” displayed on the promotional page. All Free Spins will be valid only within 24 hours of crediting.